How did a 184-pound Soviet satellite hit the United States like a ton of bricks? Just when Americans were feeling self-confident and optimistic about the future, along came the crude, kerosene-powered Sputnik launch in October 1957. The space race was underway — and the Soviets had won the first leg. The United States was agog and unnerved. To make matters worse, Sputnik appeared at a moment when America was anxious on several fronts. For starters, the bottom had fallen out of a seemingly indestructible economic boom. Stock prices, which had started to falter in the summer, had been dropping steadily in September 1957. The Dow had dropped 21% in value since July 12, 1957, and the bull market that had been in place for more than three years was now over. A recession <!-strCallout1-> was in full swing. Personal and business income were both down for the year and unemployment was on the rise. At the same time, social changes were beginning to transform the United States. A great struggle to achieve a more egalitarian society was beginning. The first civil rights legislation since Reconstruction had been enacted in Congress on September 9, 1957, less than a month before Sputnik’s launch. Add to that the appearance of Sputnik — and it becomes clear why there was a sudden crisis of confidence in U.S. technology, values, politics and the military. Science, technology and engineering were totally reworked and massively funded in the shadow of Sputnik. Gabriel Heatter, an influential news commentator for the Mutual Broadcasting System, delivered a radio editorial titled “Than You, Mr. Sputnik” in January 1958, hours after Sputnik I had fallen from orbit. The Russian satellite essentially forced the United States to place a new national priority on research science, which led to the development of microelectronics — the technology used in today’s laptop, personal and handheld computers. On another level, Sputnik affected national attitudes toward conspicuous consumption, symbolically killing off the market for the Edsel Automobile and the decadent automotive tail fin. It was argued that the engineering talents of the nation were being wasted on frivolities. Ford’s Edsel, which had been introduced the month before, with its odd <!-strCallout3-> oval puckered mouth grille centerpiece, was hardly the only example of excess at this time of dazzling grilles, festooned chrome trim, big V-8 engines and three-toned paintjobs. The Cadillac epitomized the “American Dream Car” which was so big and so thirsty for fuel that it averaged only ten miles per gallon. A higher standard of living, prior to the arrival of Sputnik, was seen as prima facie evidence of American superiority over Russian communism. It now became an emblem of national inferiority. America’s editorial writers had a field day, filling their pages with articles whose theme was the superficiality of much of U.S. technical “progress.” In the wake of Sputnik, America’s self-deprecation was boundless. While some instant experts blamed the schools for not emphasizing science and math, many others charged that the nation’s materialistic society was somehow responsible for its loss of technological superiority. The U.S. public immediately began to learn more about rockets and satellites. Russian rocket literature was largely unknown in the West, although any Russian <!-strCallout4-> could read the work of Western rocket experts. Many wondered what held it up. Schoolteachers, reporters and editorialists found themselves dipping into the theories and laws of Sir Isaac Newton, who was the first one to explain — almost 300 years earlier — how a satellite could work. Charles Darwin and his 1859 theory of evolution had been successfully kept out of many classrooms until late 1957. Only when Sputnik panicked the scientific establishment did the theory of evolution find a place in high school biology textbooks. Schools now placed new emphasis on the process of inquiry, independent thinking and the challenging of long-held assumptions. Laboratory science was stressed, urging a hands-on learning approach. The emphasis moved from teaching facts to fundamental principles. America’s children could no longer be educated traditionally. Language labs and fluency in modern languages became the order of the day. Beyond education and research, Sputnik also changed <!-strCallout5-> people’s lives in ways that eventually filtered into modern popular culture. 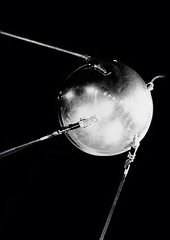 Sputnik was the instrument that gave Stephen King the “dread” that fuels his novels, caused the prolific Isaac Asimov to begin calling himself a science writer rather than a science fiction writer, inspired Ross Perot to create an electronics dynasty, and led others to become cosmonauts and astronauts. This essay is adapted from Sputnik: The Shock of the Century by Paul Dickson (Walker, 2001). Published by arrangement with the author. Copyright © 2001 by Paul Dickson. The book was reissued in paperback in 2007.